Incoco offers 15% OFF Sitewide Singles' Day Sale via coupon code DM15. Incoco offers a 10% OFF Sitewide via coupon code DM10. 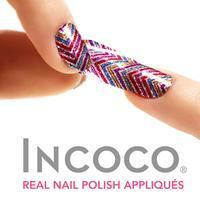 Incoco has revolutionized nail beauty with the world's first 100% real nail polish appliqués! No more drying time, smudges, or streaks. Incoco offers 10% OFF entire site via code DEALMOON10.